Here’s a tip that many Lightroom users will appreciate. If you have an extensive set of Lightroom 3 presets, you might be worried about your transition to Lightroom 4, as the sliders have all changed rendering most of the presets that you have created or obtained for Lightroom 3 useless and broken. Here’s the solution to this issue. Import your photos into Lightroom 4. In the develop module under settings -> process you can change the process type from 2012 to 2010. When you do that, all of the sliders and everything else reverts back to Lightroom 3 functionality and all of the presets work as expected. You can do this on a virtual copy of an image as well. You can also copy this change and paste it to many photos. Canon has announced a new DSLR camera today, the Canon 5D mark III. The camera that I used as my workhorse is this camera’s immediate predecessor, the Canon 5D mark II. I am excited to hear of the news of this new camera and I’ve put in a pre-order for it. This new camera seems to be less of a Canon 5D replacement as it is a baby made from a 7D mated with a 1D-X (which is another new camera that has yet to see the light of day). As with anything in life, this camera isn’t perfect, but it does seem like it will have just amazing quality and will undoubtedly let me create stunning photographs! 2 increased stops of ISO sensitivity. I often use flash photography to negate the need of high ISO’s, but having the option when flash isn’t one is definitely a great thing! The sample pictures floating around the internet from this camera look amazing! Dual card slots. I really missed this when I got the 5D II, coming from my 1D mark II N which had this. Once again, I will be less worried about a CF card failing and destroying my images. The price seems very high. That extra $1000 hurts compared to the 5D II’s price. No interchangeable focus screens! I am very used to having my Eg-S precision matte screen to help focus my large aperture lenses. I am curious how easy or not it will be to micro adjust by hand with the stock focus screen. 1/200s X-Sync speed for manual flash photographers. Come on, Canon, the EOS-1D in the year 2001 had a 1/500s sync speed…. please do better! $500 price tag for the battery grip. This is like pouring in salt on the wound. There are rumors that the grip for the 5D II will work on the 5D III, so perhaps that’s the case. Despite these con’s, I’m extremely excited about this new camera and I can’t wait to make amazing photos with it! 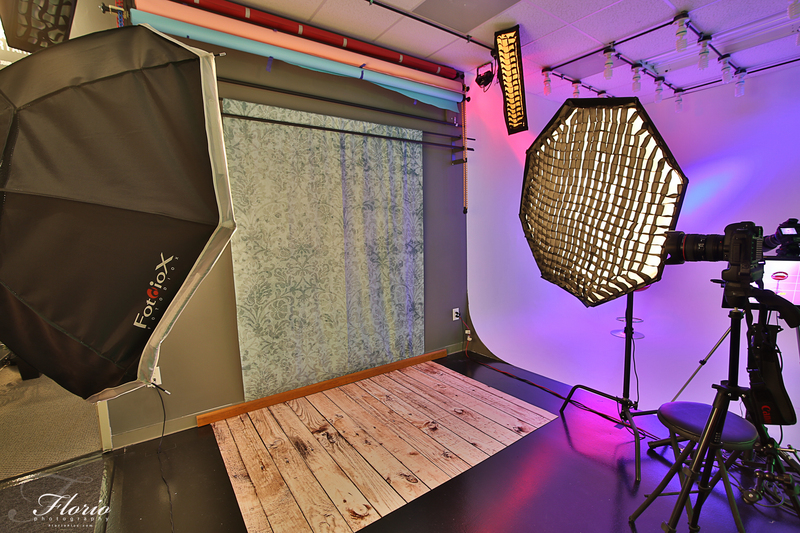 I am currently involved in an internet conversation between photographers in the Raleigh/Durham area on the benefits of shooting photos in the RAW vs JPEG formats. I must apologize in advance, as this post is going to get fairly technical, very quickly. I must also state that I am absolutely NOT in any way providing any ground-breaking information or anything that isn’t already widely known, but I have been “called out” to demonstrate in my own experience why it is best to shoot in the RAW format. Just to get everyone up to speed, the average Digital SLR in the year 2012 can shoot both a RAW and JPEG format. Let’s start with the easier one to understand, the JPEG format. The JPEG format has been around for years, according to the JPEG wiki page, since 1992 (it seems like even earlier, at least to me). Standard JPEG files store color information in 8 bits per channel, which equates to 16.8 Million colors. Every time (including the first time, if you are shooting JPEG in the camera) a JPEG file is saved, an algorithm is run to throw away data in an effort to save space and make a smaller file. This is a “lossy” algorithm, in that data is irretrievably thrown away during this process. The RAW formats are all manufacturer proprietary formats, despite the efforts by companies such as Adobe to try and push a standard format. As a history lesson, when the first DSLR cameras came out, the manufacturers wanted you to use their software to open their files and convert them to usable formats such as TIFF. You see, the RAW files that come out of DSLR’s are a dump of the information that the sensor sees at the time of the image capture. 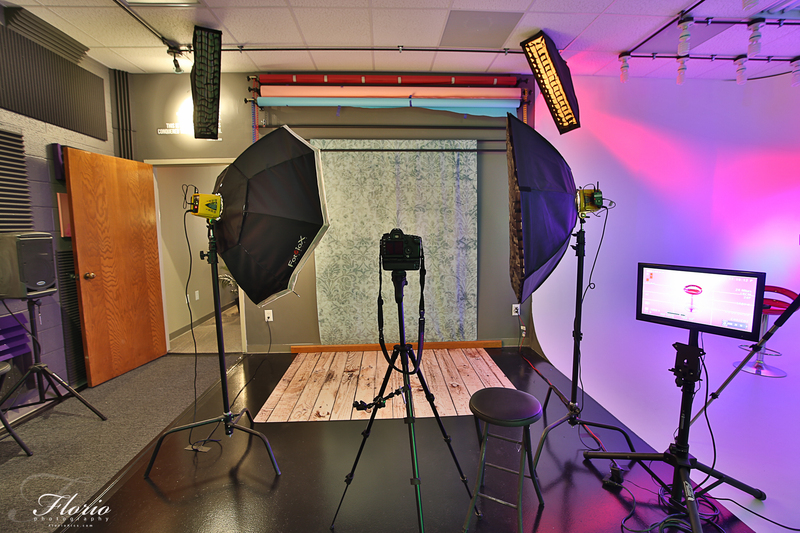 Things like white balance, contrast, color space, sharpening, etc are NOT applied to the raw data that is in the RAW file. Those settings that the camera is set to are, however, saved in the RAW file, but not not applied. One way to think about it is the camera settings are “hints” that are left in the RAW file, kind of as a starting place for your RAW converter. In order to actually open a RAW file, one must convert it. In the early days, you either used the software that the camera came with, or you used some hacks that were around that reverse engineered the formats. These days, (I think) the camera manufacturers actually work with companies like Apple and Adobe to have 3rd party integration of the raw converters into their software, as well as still providing a software program that will convert the files with the camera. I still remember the distinct pain in the rear it was to work with raw files and older-than Photoshop CS (such as Photoshop 7, which was crippled in editing anything with a larger than 8 bit per channel color space). RAW files store their color space in a 16 bit space, but most DSLR’s don’t use all of it. The camera that I utilize as my primary camera is the Canon 5D II, which uses 14 of the 16 bits of space. This gives 16384 colors per channel (there’s 3 channels, Red, Green, Blue). So, the JPEG has 16.8 Million colors, a Raw file from a 5D II can record up to 4.3 Trillion colors. Can you actually SEE the difference between 16.8 Million colors and 4.3 Trillion? No way, Jose. So why do I care? The answer is, it’s all in the edit, and also in the final use. I used to set my Canon 5D II in the “RAW + JPEG”, and to show an example of why I do this, I pulled an image from the time period when I did shoot in this way. Just as background info, I used to shoot RAW + JPEG because I thought the time that Lightroom took to manipulate images might be sped up having both files. I have come to the conclusion that it either doesn’t speed up, or that it doesn’t do so in a discernible way, so I just shoot RAW only these days. This image is from my 365 project, back on May 25th, 2010. In this image, I over-exposed the subject somewhat and had to pull information in post processing to make it look better. Had I just shot in the JPEG format, there would not have been enough detail left in the color information in this image to “fix it” satisfactorily. There was, however, enough data left in the RAW file to help me out in the post processing. Luckily, I shot in both the RAW and JPEG format in the camera, so I can use this image as the example in this blog post. The right side of the image had a strobe which created a gigantic amount of flare and also the exposure of that side of the model’s body, especially the arm, was very close to completely blown out. By blown out, I mean that the pixel’s colors would be pure white, thus devoid of details. In the JPEG version saved by the camera, that area of the model’s arm is indeed blown out in 2 of the 3 color channels. I have pulled these files into photoshop and using the curves tool you can see the clipping, which is another way to say blown out. See in the image above, that photoshop reports clipping in the skin details of the subject in one channel, and in two channels on the arm area. It is apparent here below visibly as well on the jpeg file (which was saved and just opened in photoshop, no changes made). After manipulation, we get a usable arm and the face has details using the raw file. Had I not shot in the RAW format, I would not have been able to have nearly the quality output as what I had. Using RAW is not just valuable in the edge cases like this, you also get to adjust the white balance, contrast, sharpening at your leisure (if you shoot JPEG in the camera, those settings are “baked into” the image, and there’s no adjusting after the fact). You also have every pixel to use, whereas with JPEG, you have a compressed file where much of the data is completely lost to the great bit bucket in the sky. I shoot RAW and convert later, because it is much easier than it used to be. Long gone are the days where we are tied to the Canon converter or using reversed-engineered hacks. Adobe has integrated the raw converter into Photoshop since Photoshop CS and they also have an amazing product in Adobe Lightroom. 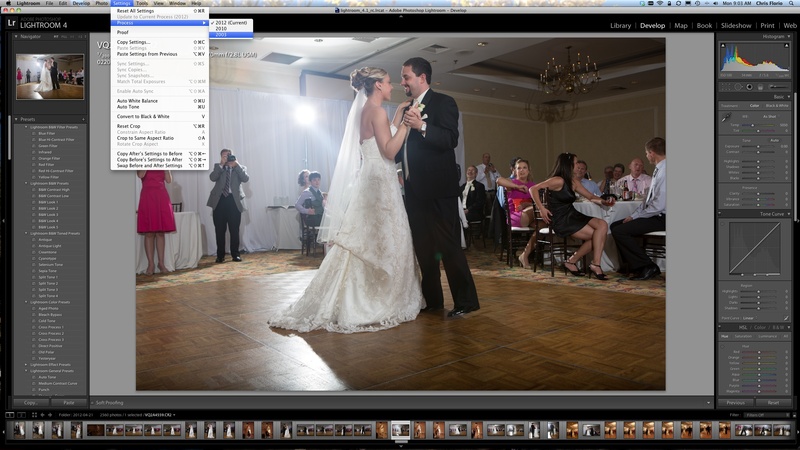 Lightroom lets me import the RAW files, make adjustments and then output JPEGS with great ease and speed. If this were still the year 2000, in the days when computers had less ram, less processor speed and power, less cores and hard disks didn’t top out in the multiples of Terabytes, then the argument could be made that shooting JPEG, for most situations, might be OK. That time is over, the computers these days, both hardware and software, slice through the RAW files with great speed, and the latitude that you keep by shooting in RAW is worth every 1 and 0 they occupy on my hard disks. I care too much about the photographs that I shoot to not have the highest quality photos at the end of the day. The meta-charity organization Activate Good is hosting the 3rd Annual Couture for a Cause on October 21st. 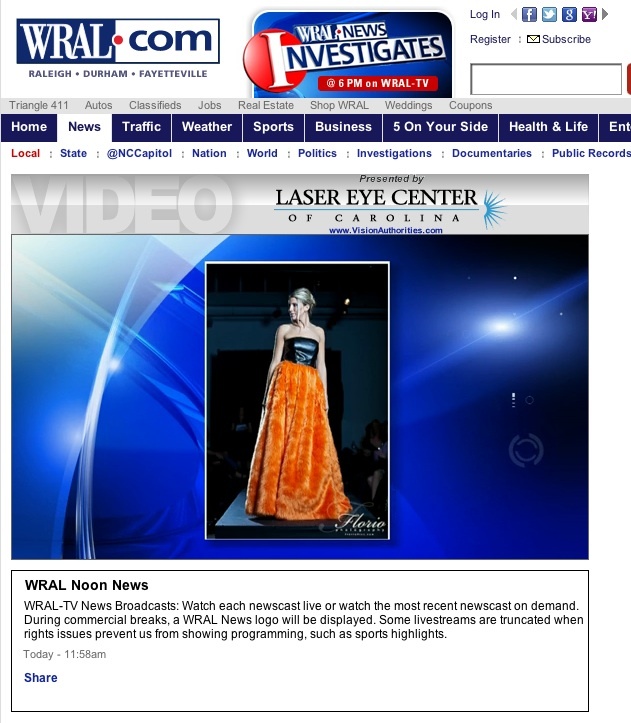 I shot photos for this fashion show last year, and the photos were displayed on WRAL’s noon news today (Direct Link to the video) when Amber Smith and Karen Huskins were interviewed about the fashion show. 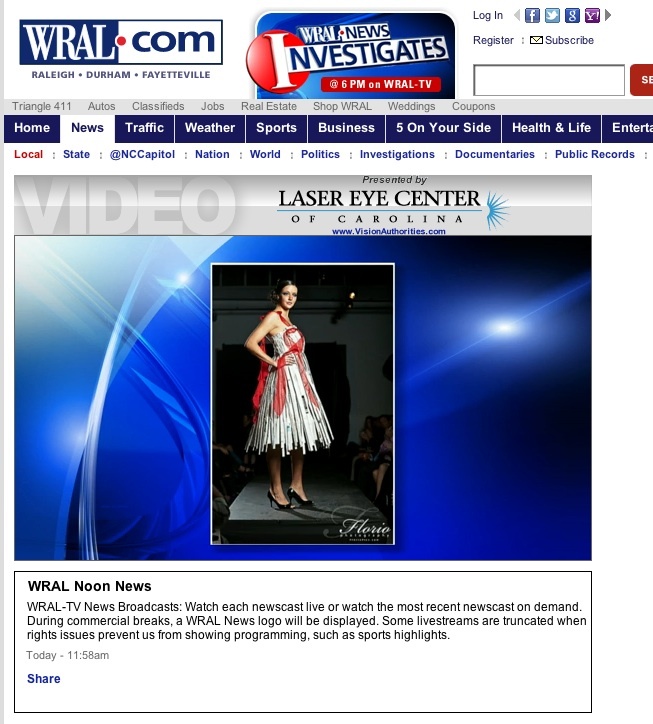 I’m extremely excited that I’m a sponsor of this year’s Couture for a Cause. If you’re free on Friday, 10/21, I highly suggest you come with me to this event, it will be something extraordinary to witness. We are doing a pre-show fashion show this Saturday, but I don’t think I’ll be allowed to post pics of the event until the day of the show. Stay tuned! The website, www.FlorioPics.com has existed since 2002, and this is at least the 4th incarnation. I have transitioned to WordPress in hopes that I will post on this blog more. The bad news is that I’ve lost all of my previous blog entries. Sigh. I think this move will be worth it, so please bear with me. I’ve been extremely busy in the last months. The rate of photoshoots, weddings, bridal portraits, classes I’ve been teaching, fashion shows and meetups I’ve been directing has been non stop.